Two ways to embed PFM-created flash slideshows to websites: professionally, or in a easy way. To incorporate the PFM-created flash slideshows created into an existing webpage, you can manually adding the <OBJECT> and <EMBED> tags to the page. You can also download or watch online video tutorial on how to embed slideshow. Step 1. View Flash Slide Show and copy the code on the page. After you click Publish Now! button, wait for the slideshow to create, and after you see the pop up box, click View Flash Slide Show button.There will be a prompt web page that contains the slideshow. Copy the code which is under the slideshow. Step 2. Open Output Folder and copy all PFM-created files to the same folder with existing HTML web page. There should be 9 files in the output folder if you chose advanced templates. Copy all of them and paste into the same folder with your HTML web page. You should upload all PFM-created files together with your HTML webpage to your web server. Done. Open the Photo Slideshow Maker program, click the menu "Preference", and click the "Sign in Go2Album" item, enter your user name and password, click "OK" to save the setting. When you proceed to the last step of creating slideshow with Photo Slideshow Maker, select the option "Create Flash File and Upload to Go2Album", and the Flash slideshow will be automatically uploaded to Go2Album. 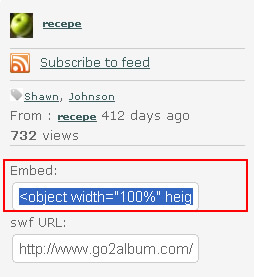 On the right sidebar of the Go2Album web page, you will see the embed code. Select and copy the HTML code. Now you get the source code. Just open the webpage, and paste the code to where you want to display the Flash slideshow. Done.